Is it the water? Maybe the wine? Or perhaps a combination of Mediterranean air mixed with vermouth, olives and jamon? In any case, whatever it is that gives Spanish architects and artists their unique perspective and vision, it is wonderful. 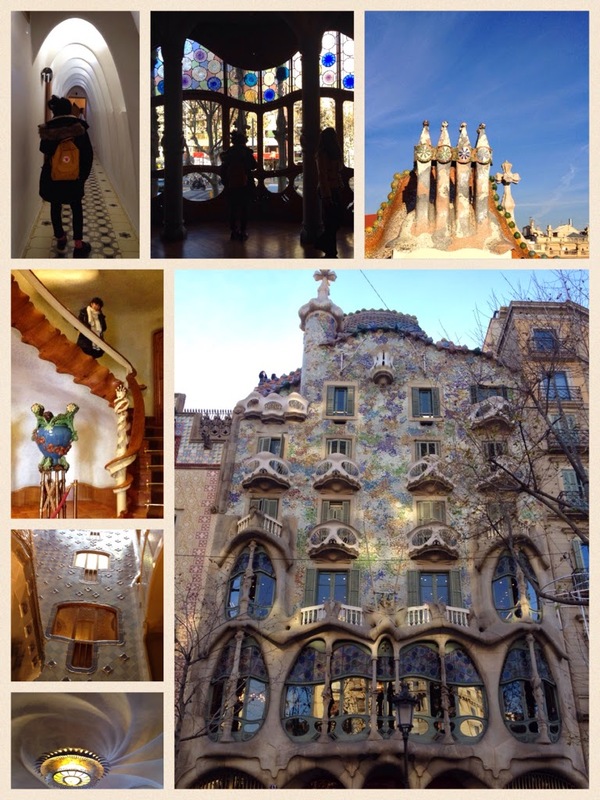 Whether it be the curvy Modernist lines and sand castle aesthetic of Antonio Gaudi, the surrealism of Dali, or the iconic artistry of Picasso, Miro and countless other artists of Catalunya, they captivate you. Even from 30 years ago the buildings and streets stay in your memory as a city that you can simply take walks and be completely exhilarated. Love this city! 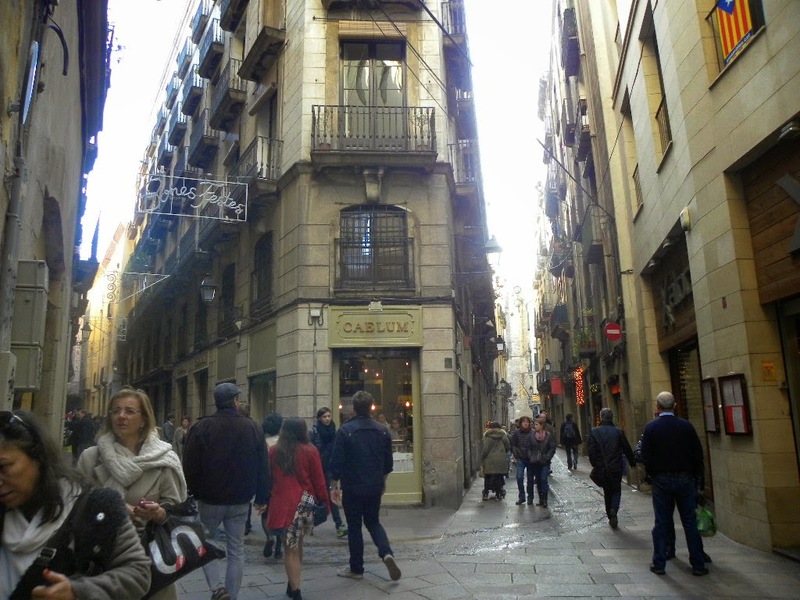 Mesmerized by the narrow curving sidewalks of the Gothic (Barri Gotic) and Born Quarters, we sit in small cafes and bars loving the vibrancy of romantic plazas. Continuing a nearly 400 year tradition of promenading with your loved one down a 1.2 km tree-lined boulevard of architecture, shops, flower stalls,"pick-pockets," assorted artists, and musicians. Incredible! otherwise known as the Barcelona Cathedral, this 15th century Gothic beauty with it's gargoyles and animals must have influenced several artists over the years. This building was built in 1904 and is called by the locals the "House of Bones". The balconies look like skulls and the roof is arched like the back of a dragon. Inside everything seems to flow like water - even the staircase appears to move like undulating waves. There are no sharp edges anywhere, including all the furniture and accessories he designed - beautiful! 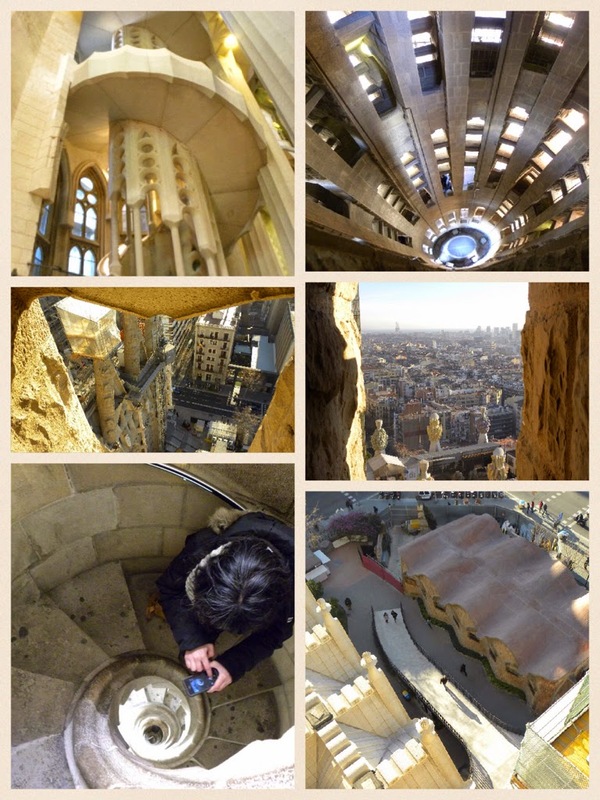 Views from the top of Sagrada Familia and walking down a very narrow staircase with Renata - Rich was smarter and opted for the elevator and is a tiny dot pictured bottom right! 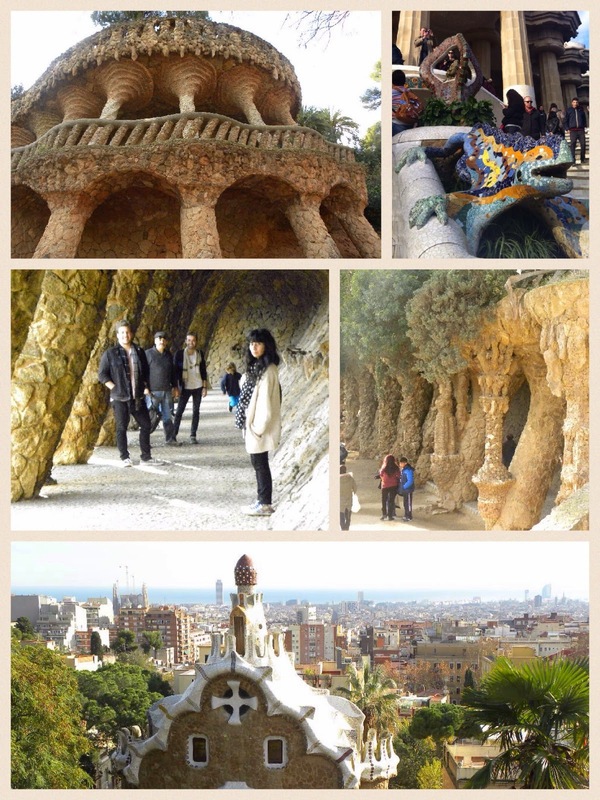 Park Guell was originally a real estate development that was given to Gaudi to draw up plans for in 1900. There was supposed to be 60 plots with views of the sea - only 2 homes were built (1 that Gaudi lived in) and all that land became a very large private garden designed by Gaudi. The site went from a private estate to a public park and is now a UNESCO World Heritage Site. Most imaginative and incredible park I have ever been to! 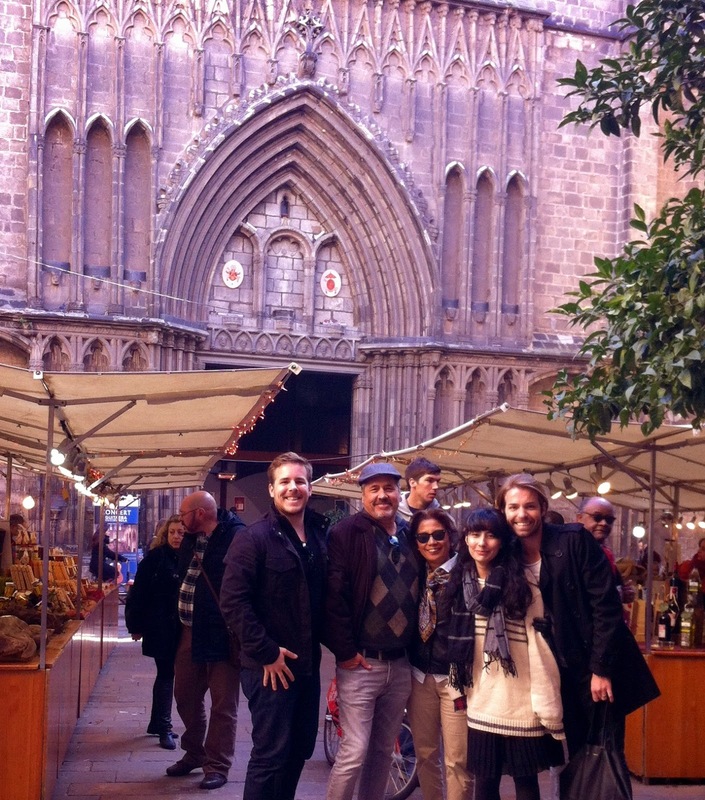 Waiting in line outside the Museu Picasso (note Rich with a bag of churros in hand). Picasso spent time in Barcelona and as a youth went to the School of Fine Arts. 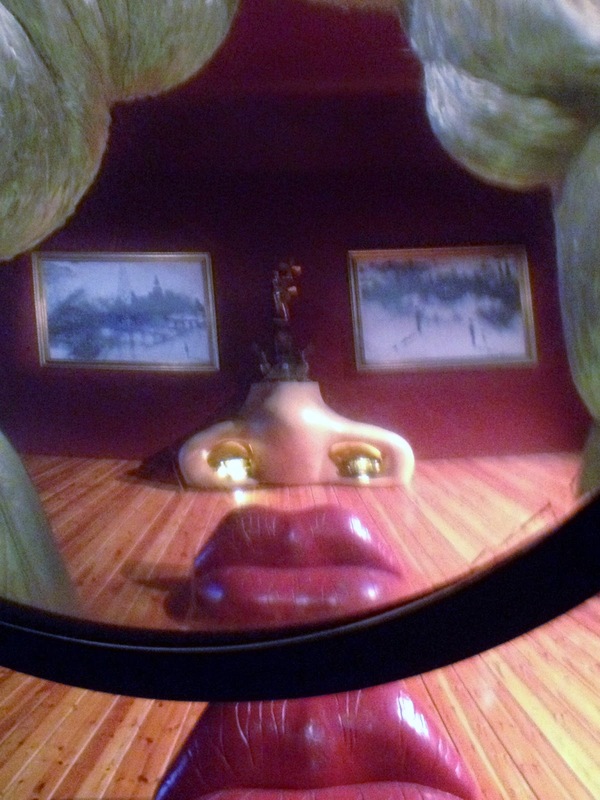 The museum has an extensive collection of over 4,200 pieces of his artwork. 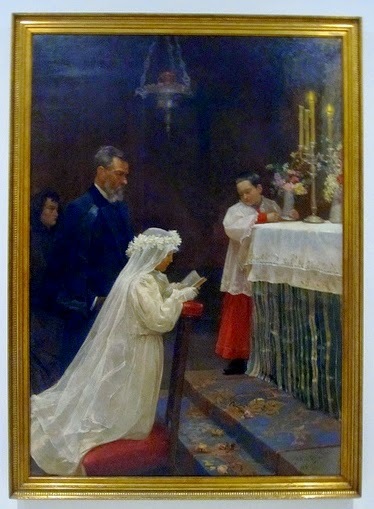 Picasso painted The Communion when he was 14 years old - (I was pretty good at drawing stick people at that age). He was a prodigy and his early years showed his extraordinary talent, but we all know he was part of the Cubist movement and spent most of his later life breaking from the traditional figurative paintings he was trained on early in life. As a teenager, Picasso hung out with all the young avant-garde artists, writers and radicals at the Els Quatre Gats (The 4 Cats) - in fact, he had an exhibition of his drawings here. A cool place in the early 1900's! 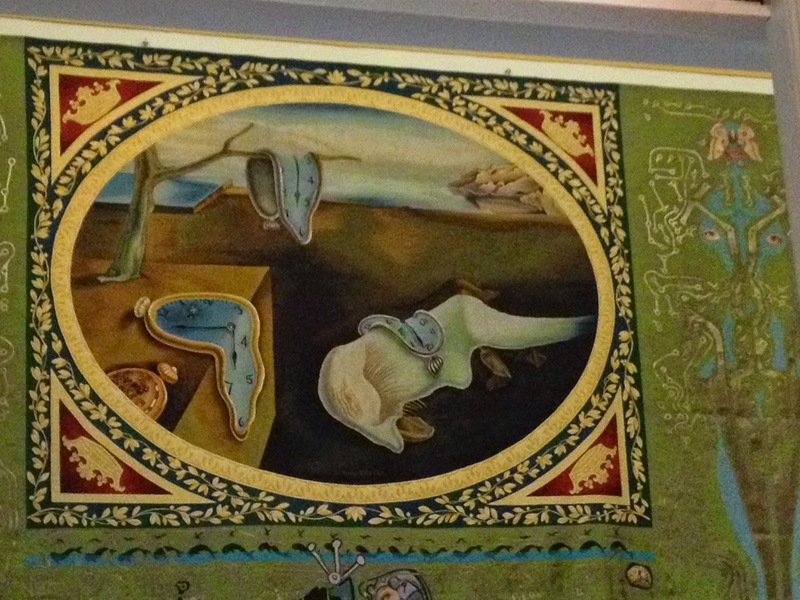 I fell in love with Dali when we were in St. Petersburg, Florida and visited the Dali Museum there - so of course, we were not going to miss his hometown museum! "Two Pigs & A Suitcase" business card! (a gratuitous selfie into a Dali like mirror ball) - we leave the Catalunya and head to southern Spain! 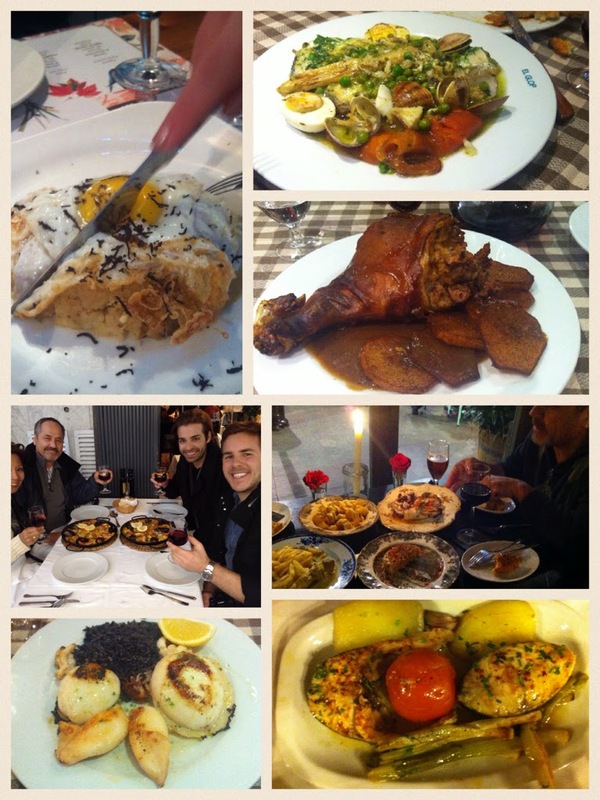 There are certain countries that are always at the top of the Food Lovers List of places to visit. Italy and Spain top our list and spending the next few months here is such a blessing, and a curse. First of all, the prices for produce, cheese and wine are such a relief from so many other countries. The ability to create a meal with fresh ingredients very inexpensively and drink wonderful wines at below $10 is one of the reasons so many people look at Spain as a possible retirement location. The curse is having to walk by bakeries, tapas bars, and restaurants with such enticing visual and olfactory offerings - I gain weight just walking down the street! Of course, having sidewalk tables with food staring up at you is brutal. 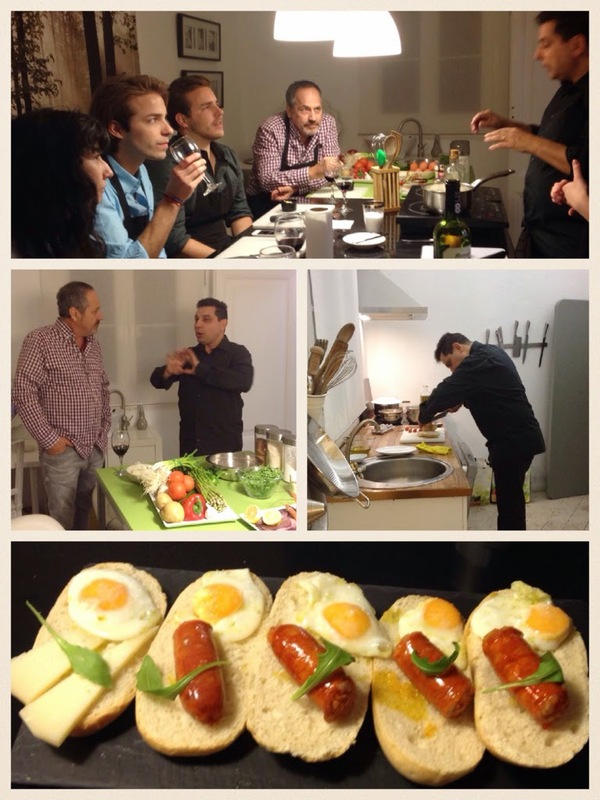 Food is an avocation in Barcelona and practiced throughout the day. 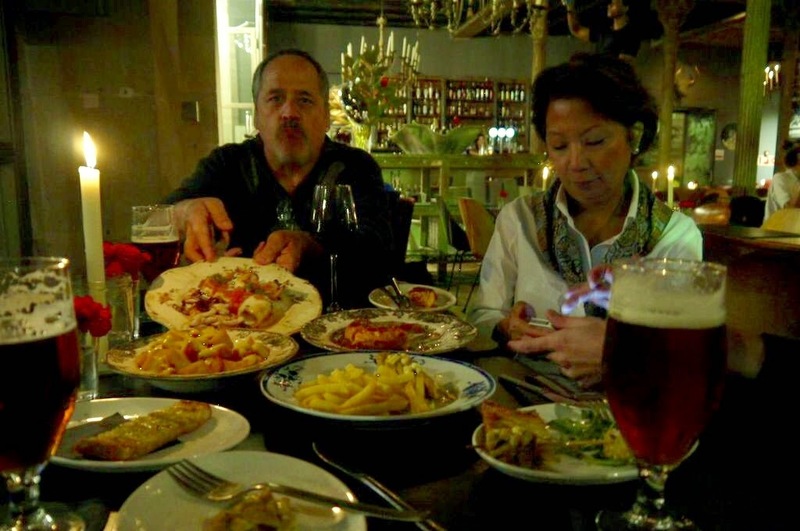 The meal is definitely a serious affair in Barcelona - ahhh, my kind of place! 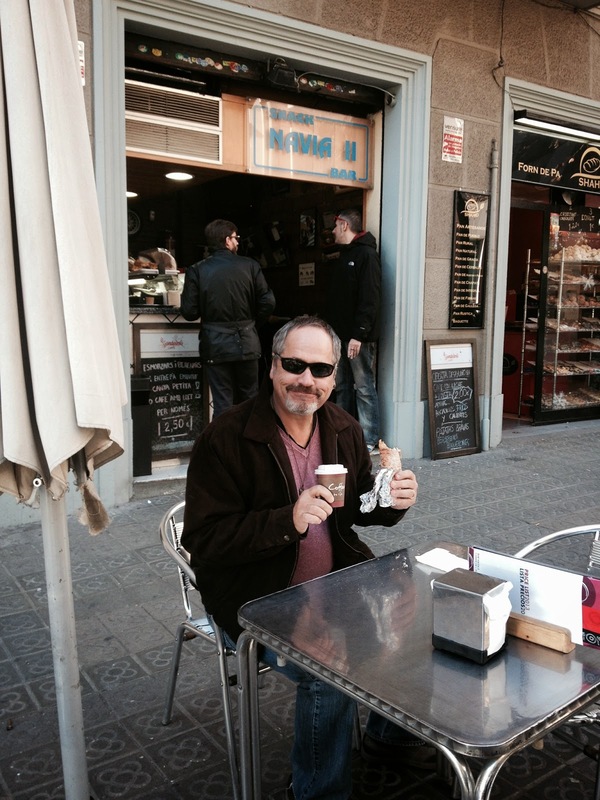 We happily adopted the local eating habits of Barcelona! Breakfast is between 8 and 10 am -breakfast is the lightest meal of the day and normally it is coffee and a biscuit or roll. 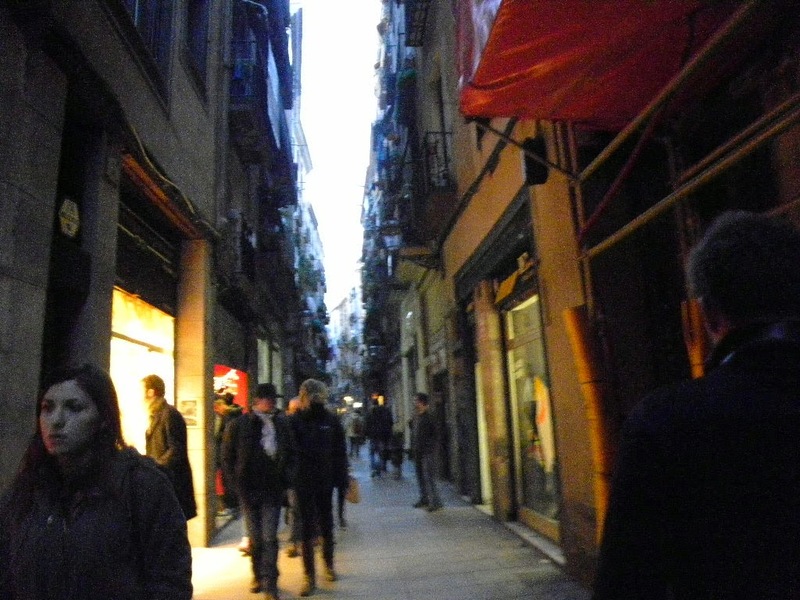 Under our apartment in the Gracia neighborhood are lots of bars, cafes, and bakeries (the fresh baked bread wakens us every morning!) and you can get a "Cafe con Leche" and a sweet roll for 2 euros - that is a pretty good deal! From 11 am to about 12:30 am, to keep one from fainting of hunger, most people will have a Media Manana or a little snack before going to lunch. 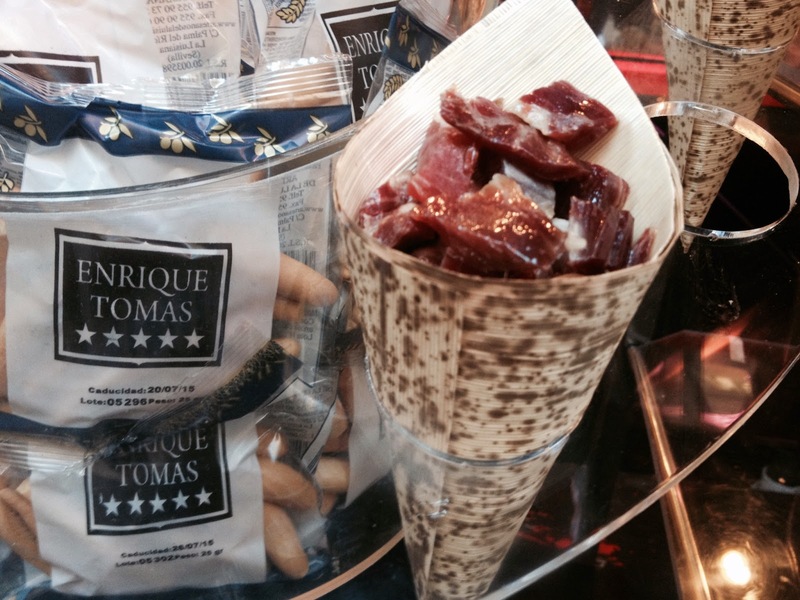 Since Rich seems to always be on the Atkins Diet, a protein snack in a cone of the famous Spanish Jamon will keep him until lunchtime - and not just any jamon it is the Iberico de Bellota - supposedly the best jamon in the world! Most locals will eat the jamon on toasted bread with olive oil and tomato. It's still snack time and tapas are served everywhere - deep fried baby squid or El Chipirons (my favorite tapa) and a potato tortilla (Rich's favorite). In the local bars and kiosks you will also see small sandwiches and a small glass of beer for a couple of Euros - we prefer tapas! The main meal of the day is Lunch eaten between 1:30 - 3:30 pm. This is when the vermouth, sangria or wine; a starter (more tapas!!! ), the main dish, (usually paella for one of us) and maybe a dessert. Once this 3 course meal is done, the "Siesta" is still respected in this country! Time for a little break or Merienda around 5 to 6 pm. The snack before dinner can be savory or sweet - we choose the sweet! Churros con chocolate! 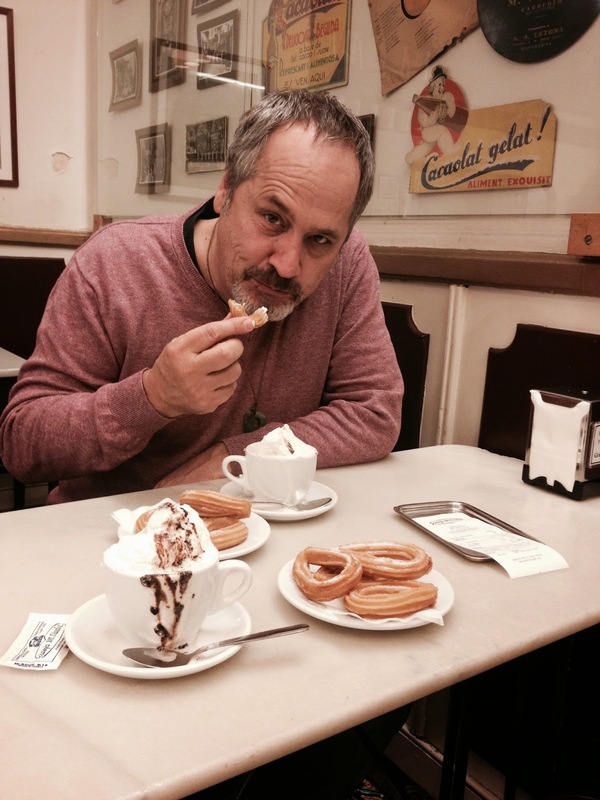 ...On another day we found Churreria Granja Ruz on Carrer Princessa, all of us agreed these were the best churros (especially the chocolate ones!) we have eaten here - we went back 3 times just to be sure! Of course, we have done savory meriendas before dinner too! 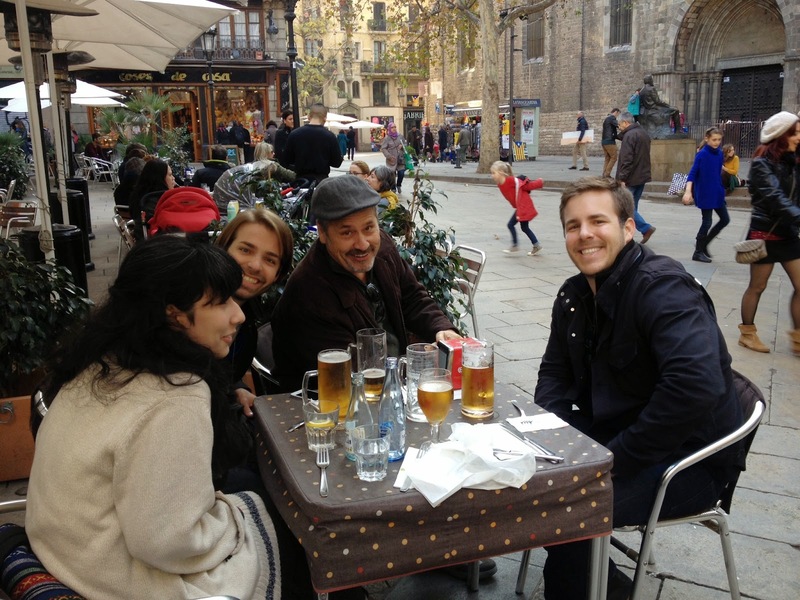 Beer and a plateful of all our favorite tapas was always a favorite repast for us! Tortillas (a potato omelet), potato bravas with aioli sauce (Spanish fries), padrons (like a mini relleno), squid, and of course the olives! Dinner time here is usually when I'm ready for bed - but not here in Barcelona! 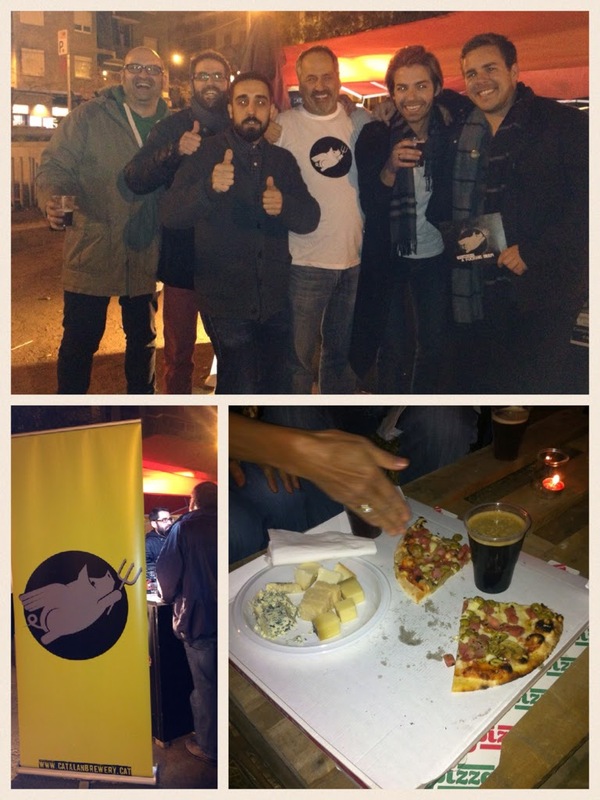 Our first weekend, the Gracia neighborhood hosted a Craft Beer Fest -a perfect place for dinner with beer, local artisan cheese, and pizza with the famous Spanish jamon on it!! And our favorite beer of the fest happened to have a pig as their logo! www.catalanbrewery.cat!! 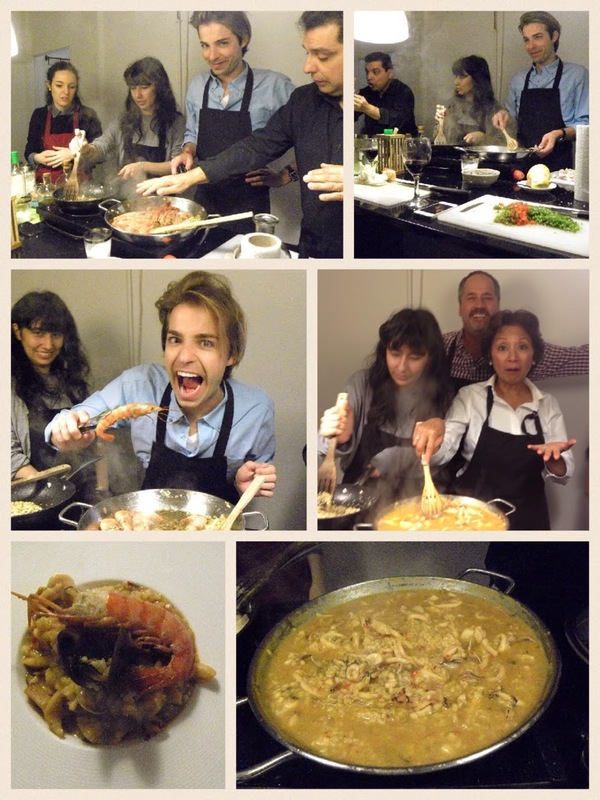 To learn more about Catalan cuisine, we decided to take a cooking class from Just Royal with chef extraordinaire Alfredo! He welcomed us with a starter of quail egg and chorizo on toast (don't pay attention to that vegetarian tapa on the left). 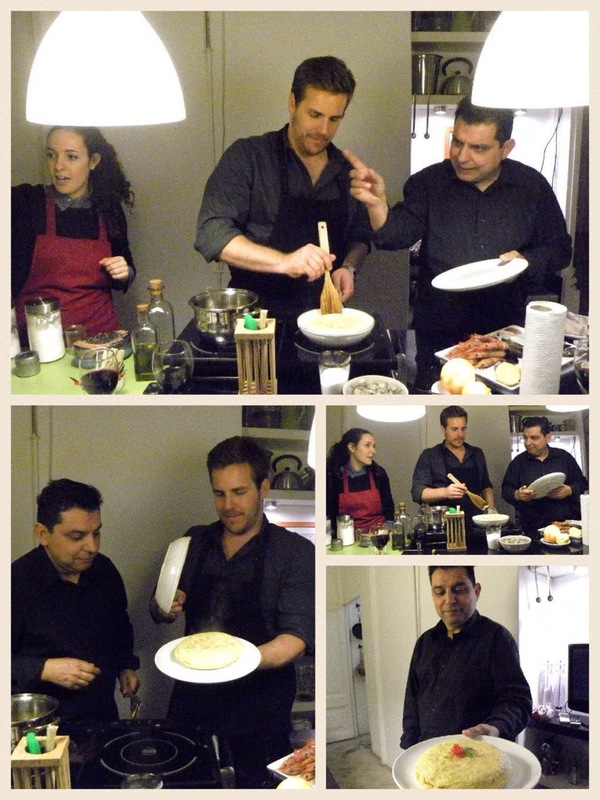 Chef Alfredo picked Trevor (since it was his birthday) to start off the class with the Spanish Potato Tortilla. So serious Trevor!... I think he was afraid he would disappoint Chef Alfredo. Wow! Look at that perfect flip - Chef Alfredo is so proud! The most famous traditional dessert in Barcelona is La Crema Catalana. I did my best to work with the chef on the dessert, but this was his baby. He did not want anyone (me) to ruin it! I have to say it was perfection! Ahhh!! 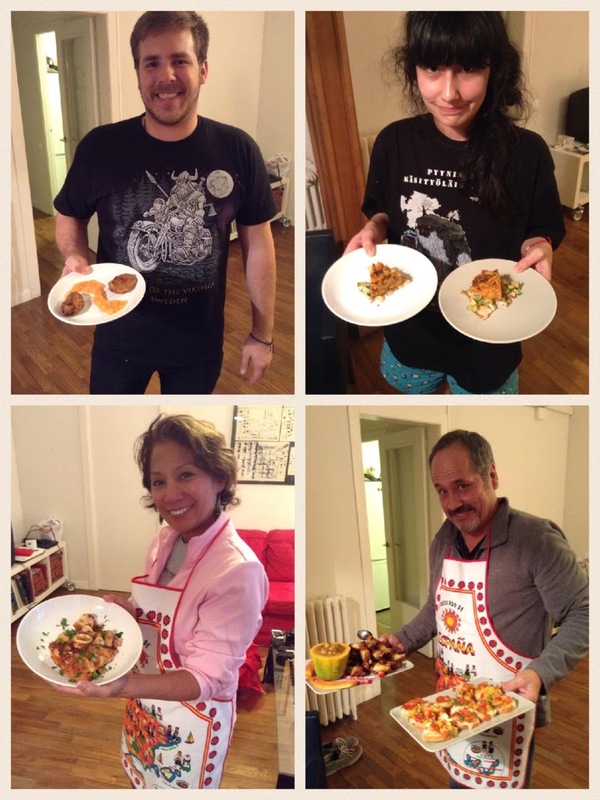 We got through the cooking and sat down and shared the meal some of us worked very hard on! 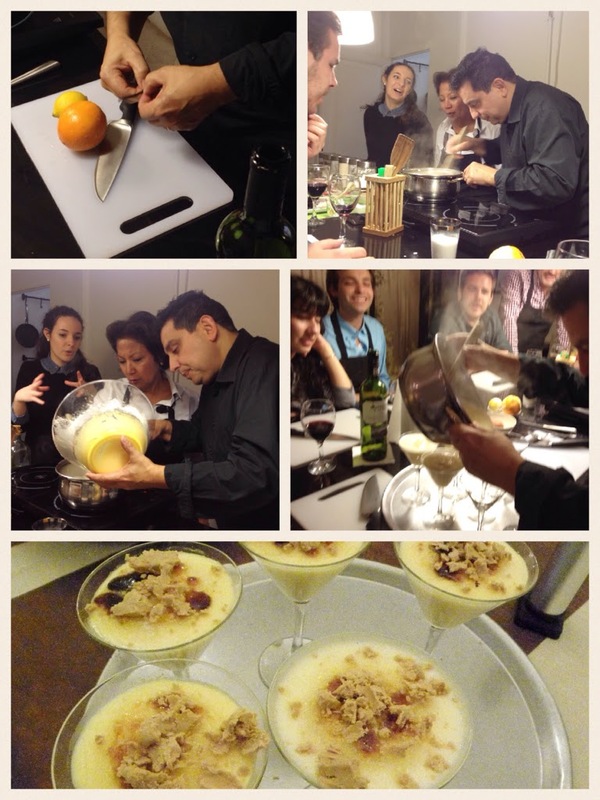 Thanks so much to Chef Alredo Rodriguez of Just Royal and Damaris Bonales (the chef's charming interpreter)! Sitting in one of the many beautiful plazas in Barcelona chatting about all the food we have eaten, and waiting once more for the tapas to arrive!! Although, at first reasoning it doesn't make sense to leave the summer of New Zealand with longer days for the chill of a Barcelona winter, but with our first moments back into this historic beautiful city, a warmth bubbled in our hearts and brought back a flood of memories from our honeymoon 32 years ago. Or perhaps that bubbling is the heartburn from an indulgence of Paella, Tapas, Churros & Chocolate with liters of Rioja to wash it down. 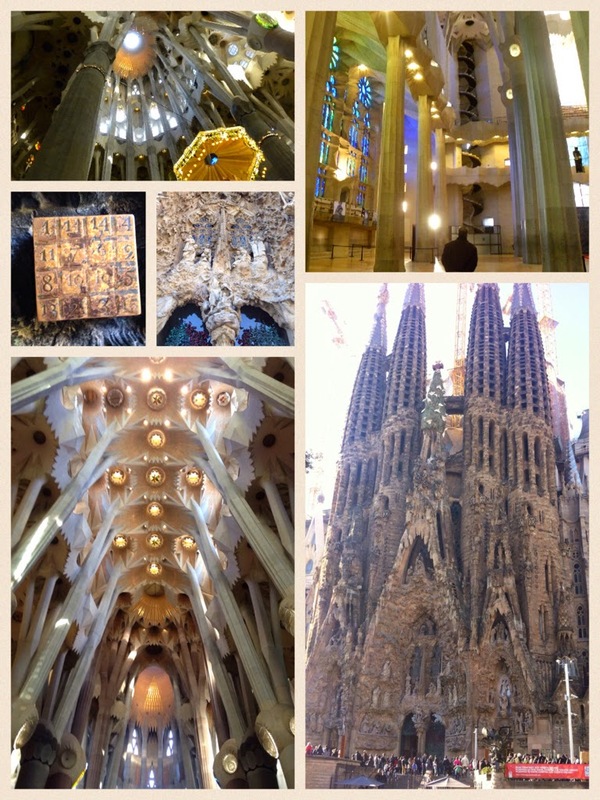 The following photo story is our holiday in Barcelona Spain - we tried to be true to the traditional culture, so you will see Catalan traditions, some Spanish traditions, and yes, even a few of our own traditions we take with us wherever we are! 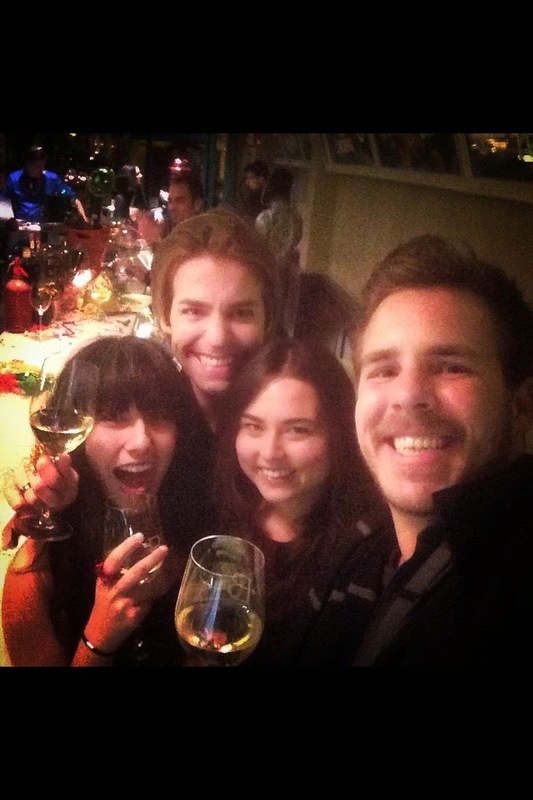 We were happily joined by the Lindroos clan - daughter Renata and nephews Eric and Trevor for the holidays! Christmas in Barcelona and the rest of Spain begins December 8th - The Feast of the Immaculate Conception and ends with the coming of the 3 Kings on January 6th. This makes for the longest celebration on the planet I think. The decoration in most Spanish homes is centered around the nativity scene. it is The Caganer! 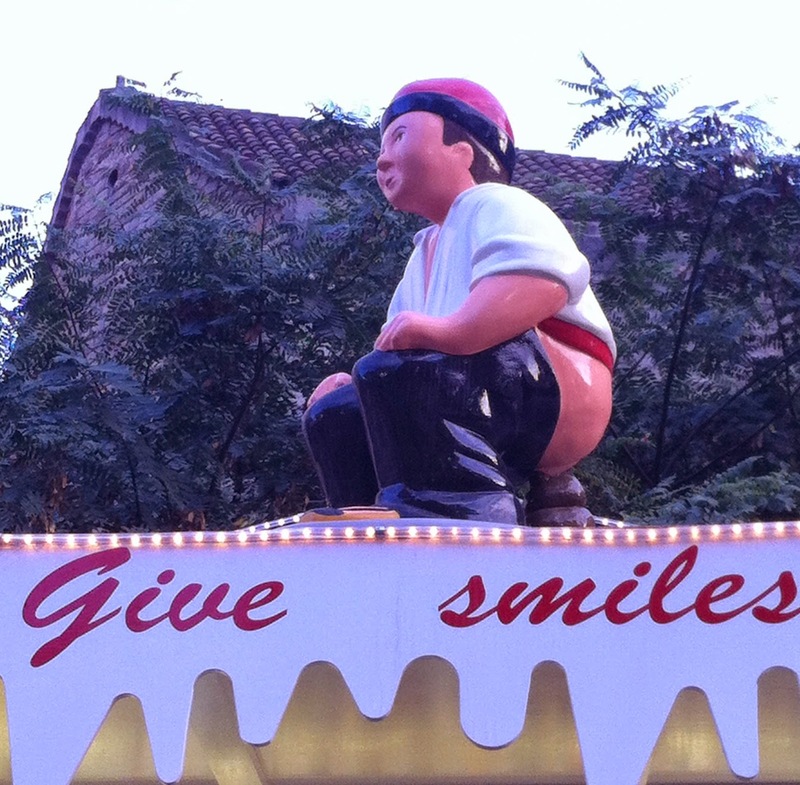 This typical Catalan figure is sold all over the Christmas markets in Barcelona - he is also called "The Pooper," "The Shitter," "The Defecating Man," or "The Man doing his duty." He represents a farmer and Catalans see poop as a sign of good luck as it fertilizes the earth and ensures a good harvest for the coming year. The Caganer is usually found squatting behind a haystack or in a hidden corner of the nativity scene for the children to find. 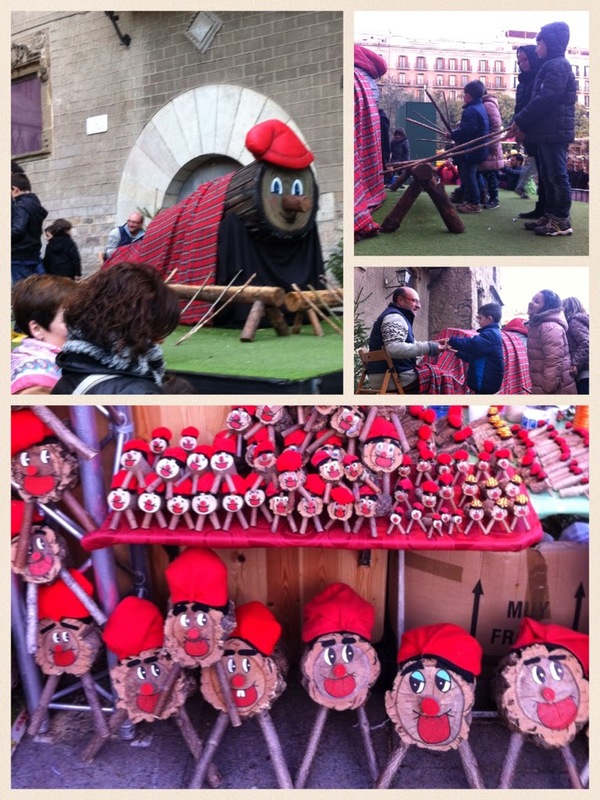 Then there is the "Cago Tio or Tio de Nadal", another Catalan tradition used to celebrate the Christmas season. It is a Pooping Log that excretes treats on Christmas Eve. You can find logs in the Christmas market to buy, but normally the family at the beginning of the Christmas season creates one on December 8th. 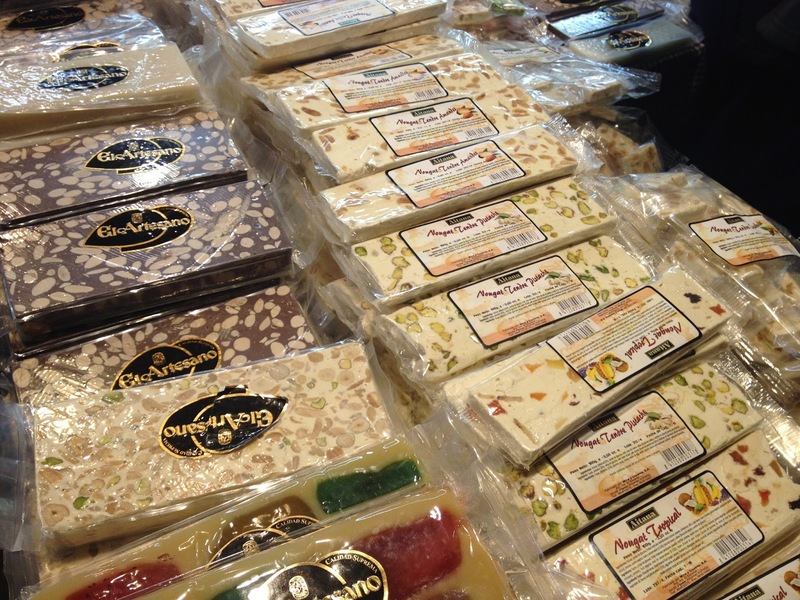 His behind is wrapped in a blanket and he is fed "Turron" (A Spanish nougat candy pictured above) every evening. It is thought that the more the "Caga Tio" is fed, the more presents and Christmas goodies will be excreted from his behind on Christmas Eve. There were festive Christmas markets around the city (sorry, none compared to Vienna- I think I missed all the food booths and Gluh wine - see last years post) and the weather for December was crisp and beautiful. Wonderful walking weather! 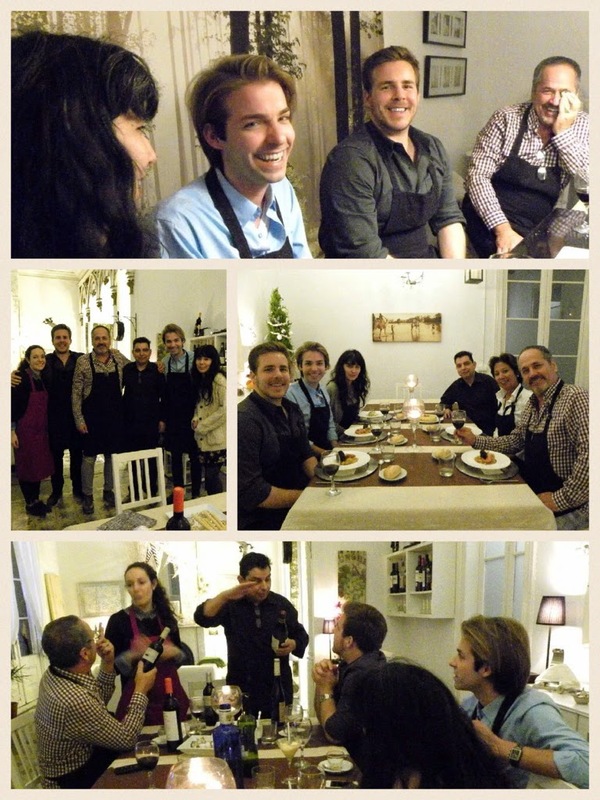 Nit de Nadal or Christmas Eve in Barcelona is a day of family and feasting! A typical Christmas Eve dinner includes "Escudella i carn d'olla" - a pasta of galets in a meat and vegetable soup or stew. 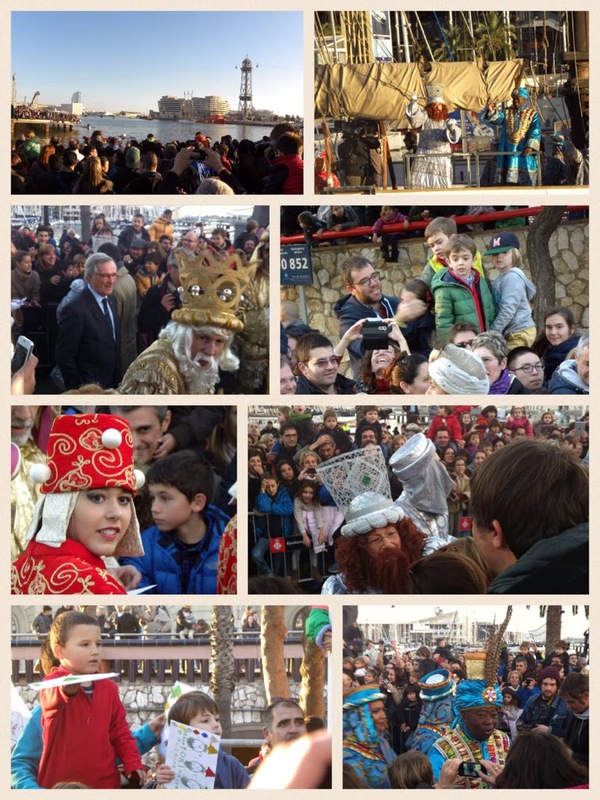 It is also time to beat the "pooh" out of the beloved Tio de Nadal and receive small gifts and candy. The exchange of big gifts does not happen until the 6th of January, the 12th day of Christmas or Epiphany. 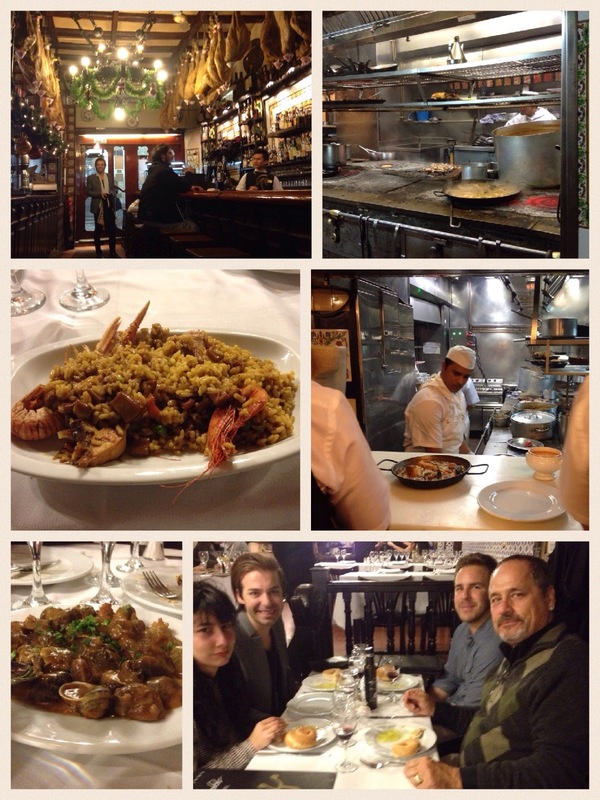 We celebrated Christmas Eve by going out to dinner at Los Caracoles in the Gotic area of Barcelona. The restaurant has been around since 1835 - and it was a memory for us in 1982, (though blurry for me) as Rich and I ate Paella here. Now we get to share the memory and create a new one with Renata, Eric, and Trevor. Lots of Tapas, Seafood Paella, Fish, Caracoles (Snails), and a Vegetarian Paella for the daughter, of course we cannot forget the Sangria! It was a feast! 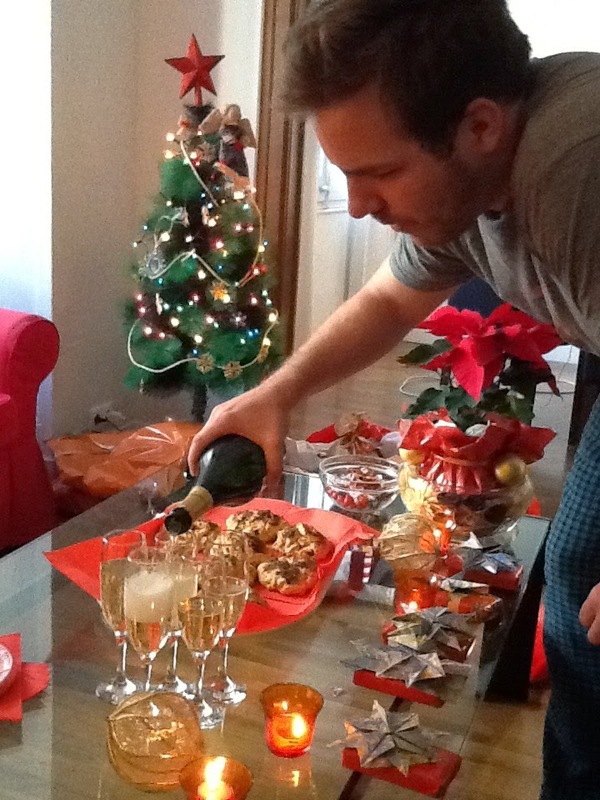 During Christmas everyone drinks lots of CAVA (Spanish Champagne)! Of course we are going to follow that tradition and you can see nephew Trevor pouring freely! 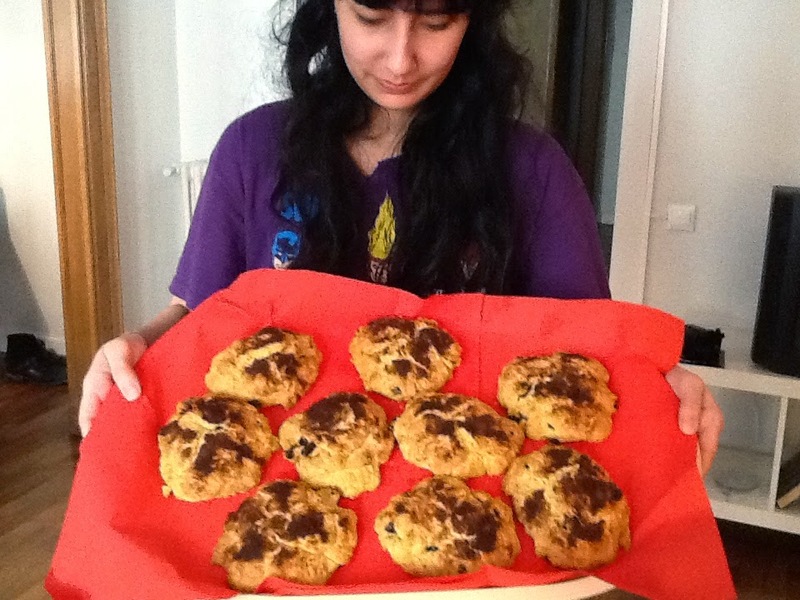 We continued our own family tradition of Christmas scones by Renata - we will just rename the scones in honor of being in Barcelona and call it by the Catalan name "El Pa de Nadal" or Christmas Bread! Did we really stay in our PJ's all day?? Our Christmas lunch was very close to a traditional Catalan lunch that consisted of the stuffed turkey or "carn d'olla" and our "Escudella" was created vegetarian style with galets and cheese! This post is getting a little long, so we will fast forward to New Year's Eve Day for an important Lindroos tradition during the holidays - a Top Chef Tournament! 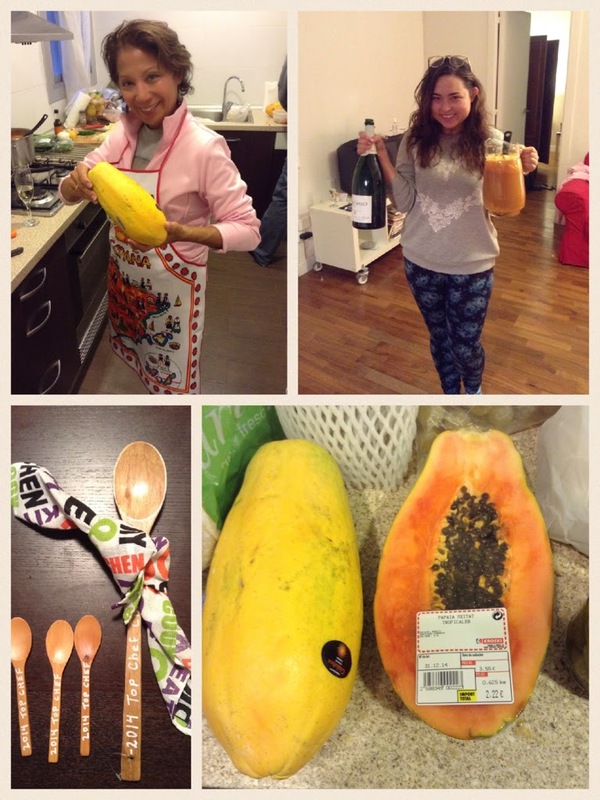 The secret ingredient for the contest is Papaya (an exotic fruit not found in Spain??!!) picked by our judges Victoria (who just joined us and from California and is currently teaching English in Spain) and Eric (who is also the photographer for the event). What kind of secret ingredient is this???? Victoria started us off with a papaya/cava drink that may put her in the competition next year - tasty and potent!! and Rich made a papaya salsa served with brochetta and chicken wings. 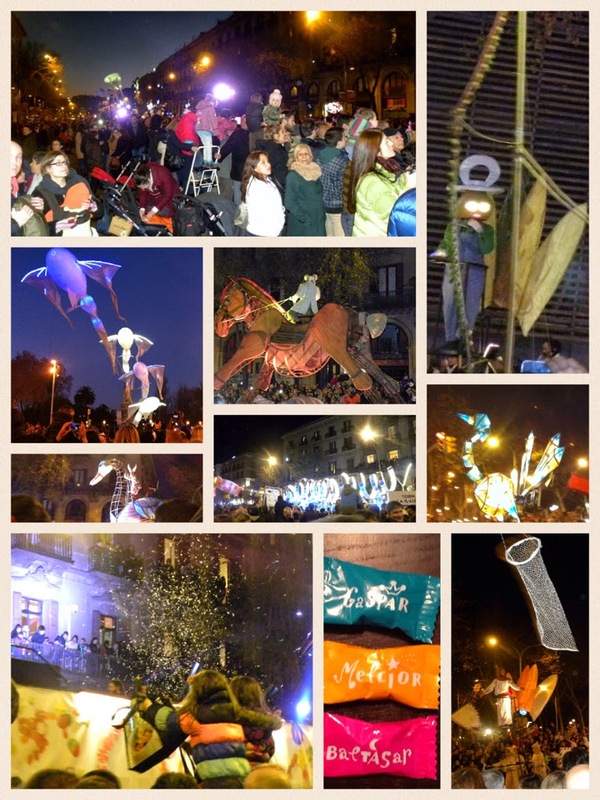 A very important tradition in Barcelona and all over Spain happens at the stroke of midnight on New Years Eve. The church bells will chime 12 times, and with each chime you quickly eat a grape. If you can manage to eat a grape for every chime you will have a lucky and prosperous year! New red underwear to wear New Years Eve is another Spanish tradition for luck. I'm sure Eric will need all the luck he can get New Years Eve! Rich and I spent New Year's Eve with probably 100,000 or more locals at the Official Barcelona New Years Eve Celebration at the Plaza Espanya. You can see The National Museum of Art of Catalonia in the background. ...The Kings' Day Parade or the "Cavalcada de Reis" is the biggest parade in Barcelona and draws 500,000 people along a 5 km parade route. This is the childrens' last chance to get their letters and pacifiers to the 3 Kings. Along the route there are letter collectors with long nets going out into the crowds. When little ones are ready to give up their pacifier, they have a pacifier collector too! The parade ends with floats shooting out tons of candy named for each of the 3 Kings. You can see children on ladders and their parents' shoulders holding out their bags to catch the candy being pelted at everyone. We caught our share! 5 pounds later, the longest Christmas is over !